The exact origins of Aromatherapy, in the context of ‘using the aromatic and healing properties of plants for personal and therapeutic purposes’ are ‘hidden in the mists of time’. However, archaeological and documented evidence suggests that plants (and their individual constituents; flowers, petals, bark, leaves, roots, seeds, oils, essences, spices etc,) have been used by people throughout the world, and incorporated into their traditional lifestyles to help define the very essence of many cultures. Plants, and their unique colours and exquisite aromas, have been used as an integral part of tradition bound rituals ranging from; the purest religious offering, celebrating the birth of ‘new’ lives and marital alliances, expressing the heightened sentiments of affection and bereavement to personal adornment and creating the ‘ultimate beautifying rituals which calm the mind, relax the body and indulge the senses’. (2) the influences of aroma on a specific part of the brain, called the limbic system - which is believed to support a variety of functions including an individuals; emotions, behaviour, memory, personal motivation and desire. 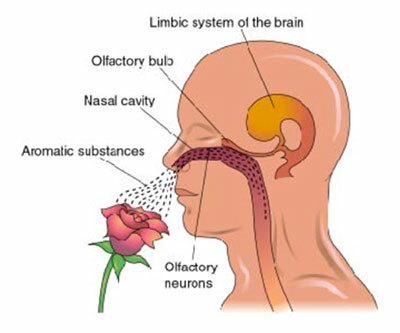 It’s easy to forget that our sense of smell is the most primitive of our senses! Aromatherapy is a form of holistic therapy that uses the pure, natural, volatile aromatic plant materials, known as essential oils, to ‘aid relaxation, activate the body’s own healing mechanism and enhance an individual’s physical, mental and emotional wellbeing’. As with all forms of holistic and complementary therapy, it is the whole person who is treated and not just the condition; symptoms are considered as the body’s attempt to maintain balance and harmony. An Aromatherapy treatment usually involves using a synergistic blend of essential oils, to suit the individual’s physical and psychological/emotional needs and preferences, in the form of a massage. The essential oils, which are considered to be the plant hormone or ‘life-source’ of the plant, are absorbed by the blood stream enhancing the circulation and cell renewal, while their aromas act on the deepest parts of the brain to enhance the mental spirit, mood and emotions. The individuals emotional state and willingness to (1) provide verbal feedback, about ‘the sensations they feel’ during the treatment and (2) commit to following the recommended after-treatment and home-care advice, are also essential requirements for effective treatment progress and results. Aromatherapy helps to restore and maintain the body's natural equilibrium (homeostasis) and release chemicals, such as endorphins that reduce pain and stress. Over the course of several treatments, the body works ‘naturally to heal itself’. Aromatherapy treatment is a powerful way of re-balancing and harmonising the body as a whole. Aromatherapy, apart from being a very relaxing treatment, has been a popular form of holistic therapy to help alleviate the symptoms of the following stress related conditions; skin disorders, tension headaches, migraines, anxiety, depression, panic attacks, stress, sleeping problems (insomnia), memory loss, hair loss, sinus problems, breathing problems, digestive problems, arthritis/joint based problems, back pain, postural problems, sports injuries, hormonal imbalances, premenstrual syndrome (PMS), fertility, menopause and poor circulation. As with most other holistic and complementary therapies, Aromatherapy is totally safe for people of all ages; especially the elderly and people in convalescence. It is renowned for bringing relief from a wide range of acute and chronic conditions, and works in tandem with, and is not a substitute for conventional medicine. It is important to remember that an Aromatherapist does not treat or diagnose any condition; it is the ‘continued release from the symptoms of stress which helps manage pain’. If you are being treated by a GP for anything please let the Aromatherapist know in advance.